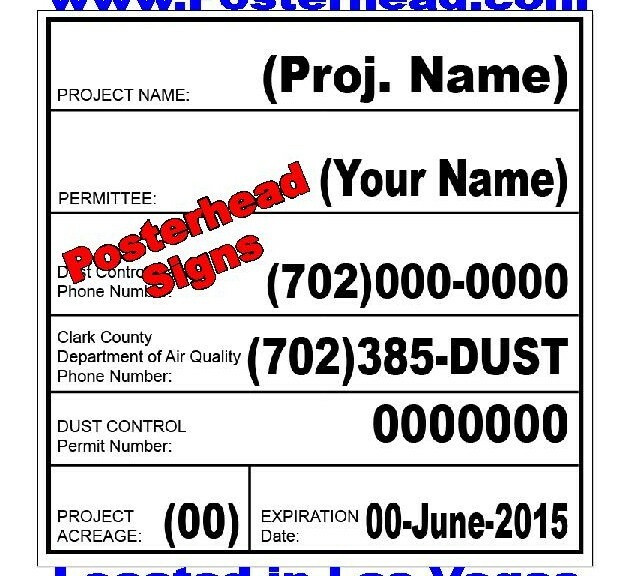 April 25, 2016 Robert W.
Dust permitting signs are required by Clark County Air Quality Management Board. Dust permitting signs information can be found at their website, http://www.clarkcountynv.gov/airquality/Pages/default.aspx. The Clark County Air Quality Management Board has specific rules and regulations that must be followed, otherwise, fines and work stops can be ordered. Dust permitting signs sizes vary with the acreage of the construction project. For 10 acres or less, a 4ft x 4ft sign is required with specific lettering and text sizes. For construction projects that are 10 acres or more, a 4ft x 8ft dust permitting sign is required , again with specific text and lettering size. Traditionally, dust control signs were made with wood and then either had a vinyl plotted letter application applied or a full color print. These signs were heavy and difficult to install because of the weight. With modern technology, a die bond panel ( double sided aluminum panel with a filler) is used for the dust control signs that make it much easier to work with and stronger. While wood signs are subject to weather deterioration, aluminum signs will weather the elements much better. This is important, especially when a long construction project is required and the signs need to be updated with different modification lettering. Dust permitting signs are not expensive. A 4ft x 4ft dust control sign made with a tough aluminum panel is less than $100 and a 4ft x 8ft dust permitting signs is $175.00. These signs will have the necessary text and lettering size to be in compliance with the regulations set forth by the Clark County Air Quality management Board. Installing dust permitting signs is easy. Two 4″ x 4″ posts are recommended for the 4ft x 4ft dust control sign and 3 – 4″ x 4″ wood posts are recommended for the 4ft x 8ft dust control sign with cross bracing. The winds sometimes get very bad in Las Vegas so make sure your holes are deep and the sign is very sturdy. April 20, 2016 Robert W.
Car magnets Henderson Nevada allow for advertising on vehicles for small and medium size businesses at a low cost. Car magnets are very cheap and offer a great way to get exposure to your company. Many business people easily turn their personal vehicle into a business vehicle by simply adding a pair of car magnets to the vehicle. By placing a car magnet on each side of the vehicle on the doors, they get their advertising message across to all the other vehicles that are around them. After an initial minimal cost, these car magnets offer a very low cost approach to advertising. How low cost ? A set of car magnets Henderson Nevada cost about $30.00 for a set of (2). The size of the magnets are 12″ x 18″ and many other magnet sizes are available as well. The 12″ x 18″ car magnets are the most popular and offer increased protection against the magnet being removed by the wind at freeway speeds. Larger magnets are heavier and can move around when jostled, giving more of an opportunity to be blown off the vehicle. Car Magnets Henderson Nevada are full color magnets that can have as many colors as you want. In addition, the car magnets can have logos and pictures printed on them as well. This is very popular with real estate agents who like to have a picture associated with a name. Many other Las Vegas businessman use car magnets as well. People like insurance agents, small contractors, delivery drivers, print shops, sign shops, and restaurants sue these vehicle magnets with great success. People can easily identify a pizza delivery vehicle and note what pizza restaurant they are, in case they wish to order some food. After all, it must be tasty food if neighbors are ordering from them. 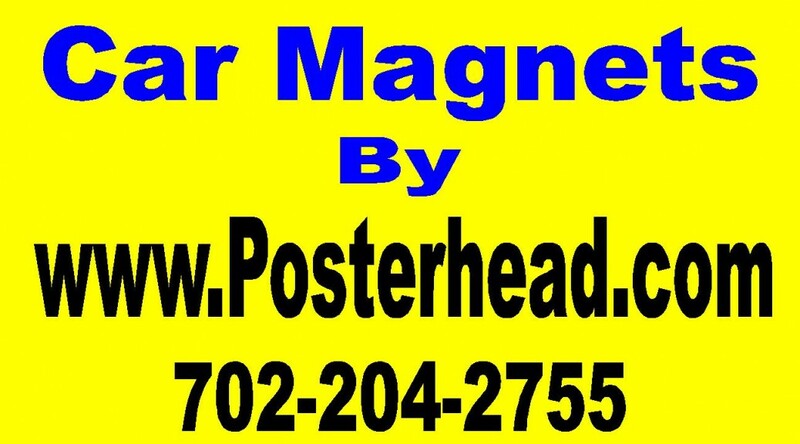 Car magnets Henderson Nevada can be found at local sign shops in the area and custom made for you at a very low price. Vinyl Banners Las Vegas For Businesses. April 19, 2016 Robert W.
Vinyl banners Las Vegas allow for a business to advertise the products and services at a low cost. These inexpensive vinyl banners are a great way to get a cross your companies marketing plan in an effective and parsimonious way. Traffic studies in Las Vegas indicate that there are more vehicles on the road than ever before. People from all across the United States are migrating here because of the climate and fun that is available 24/7. Consequently, many small businesses are learning to place vinyl banners Las Vegas on their buildings in order to attract the attention of the thousands of vehicles that use the streets of Las Vegas every single day. By placing advertising banners on fences and attaching them to the stores locations, they act as sort of a small billboard that people can see. They are also a great way to bring attention to your business as they can be printed in all sorts of colors and sizes to make them really stand out. If you are lucky enough to have a store or business next to the freeway, many of these businesses are placing very large banners on their buildings so that they can be seen by the thousands of vehicles that drive on the freeways everyday. They are taking advantage of the rush freeway traffic that has everybody driving slowly. When people are in traffic jams, they are listening to their music and looking around and notice these very large banners. 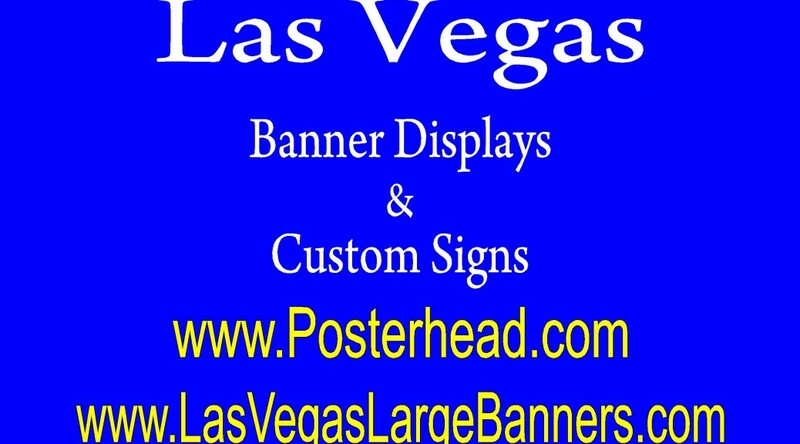 Places like www.LasVegasLargeBanners.com are a great place to purchase exceptionally large banners. Vinyl banners Las Vegas are available in the Las Vegas signs shops at very competitive pricing. The average cost of a vinyl banner is about $2.00 a square foot and that is for a full color banner printed on a 13 ounce banner material with grommets that allow for easy installation. Poster Banner Signs For Advertising. April 14, 2016 Robert W.
Poster banner signs are a cheap and economical way to advertise a business. Poster banner signs are very inexpensive and can bring in a lot of customers when displayed properly at your business location. These poster banner signs are easy to install yourself, thus saving money on installation fees. Poster banner signs are inexpensive when compared to other forms of advertising. Mailings, print advertising in newspapers and magazines, television and radio ads are an expensive way to advertise. By placing a banner at your location, you have the opportunity to take advantage of the vehicle traffic that passes by your location everyday. As Las Vegas grows, so does the vehicle traffic on the streets. The State of Nevada has traffic flow counts that verify that thousands of vehicles drive on the major streets of Las Vegas every single day. Streets such as Sahara Ave, Rainbow, Eastern, Wig Wam and many others have large traffic flows. Why not take advantage of these passing vehicles by hanging a advertising banner oat your store location so that it can be seen by these people passing by. Advertising banners are not expensive. The average cost of a full color advertising banner is about $2.00 a square foot. These banners can be printed with pictures and logos to help brand your store or simply to advertise your goods and services that your company offers. Many eateries in Las Vegas will advertise lunch or dinner specials on these banners in the hopes of enticing people traveling by to stop and eat with great success. I know of one pizza place that advertises a weekly special of pizza, wings or some other type of food and makes a lot of money off the specials. So that the food special does not go stale, they rotate their banners weekly so that some new food is always being advertised. This type of advertising works well in Las Vegas. April 7, 2016 Robert W.
Las Vegas 8ft x 8ft step and repeat banners are being used in Las Vegas by a variety of people , businesses and other organizations as a way to promote themselves. Las Vegas 8ft x 8ft Step and Repeat Banners are inexpensive enough that everybody can use them. Large step and repeat banners are being used by businesses like night clubs, casinos, trade shows and conventions, etc. to promote their businesses. The tourists that come to Las Vegas love to take selfies and group pictures against the step and repeat banners at the night clubs as souvenirs of their trip. The casinos use them for the same purpose as the night clubs and hope that the background text of their names and logos entice people to come back to their casino. Las Vegas 8ft x 8ft step and repeat banners are used a great deal at the many conventions and trade shows in Las Vegas . Las Vegas 8ft x 8ft step and repeat banners are also being used at school functions like Homecoming, Proms, and Graduation Night. The 8ft x 8ft banners are placed in an area and have the school logos and the event name on them with the year and people ( couples) take their pictures against the banners as a way to remember the nights festivities forever and ever. Las Vegas 8ft x 8ft step and repeat banners can be found at local sign or print shops in the area. April 1, 2016 Robert W.
Custom step and repeat banners are the new rage in Las Vegas . Many casinos and night clubs are using these custom step and repeat banners to promote themselves and their sponsors. They are inexpensive and people , especially tourists, love to take selfies against them as a souvenir of visiting Las Vegas. Custom step and repeat banners are very popular at the night clubs where people love to go and “party” hard in town. Las Vegas has some of the best night clubs in the world and offer 24 hour excitement. When night clubs put these custom step and repeat banners along their walls, people will take group pictures to remind themselves of the great experience they had in the nightclub. Many times sponsors will pay for the banners so that they have their name on the banner as well as a means of brand advertising. What is a custom step and repeat banner ? Custom step and repeat banners are vinyl banners with a matte finish ( to reduce glare of lights and flashes) that have a name or logo repeated over and over again in a methodical fashion so that from no matter what angle a photograph or video is taken, the logos will appear in the background. The custom step and repeat banner will then be placed along a wall or on an adjustable self standing display stand in a convenient area that will allow for photographs to be taken. usually, the matte banner material is a 13 ounce banner material known for its strength and durability. Other times, people will sometimes use fabric as their step and repeat banner. Custom step and repeat banners can be found online and at sign shops in the Las Vegas area. Many people prefer to be local so that the banner is guaranteed to be free from any type of shipping damage. Las Vegas party banners are a fun way to express an event. Las Vegas party banners can be used for a variety of special events like birthdays, graduations, retirements, promotions, happy hours, etc. These banners can be very fun and creative and really ad to the atmosphere of the event. The number one party banner is the birthday banner. Not only are they for children, they can be used for adults as well. Many times the birthday person’s name, age, balloons and even a picture are placed on the banner and a little room is left on the banner so that everybody can write well wishes to the birthday person. The banner at the end of the party is rolled up so that it can be viewed and remembered at a later date. Las Vegas party banners are also for school graduations and parties, retirements after a long life in the work force and for a variety of other reasons. Retirement parties are always fun since the person who retires has had a laborious life and wishes to enjoy a more peaceful environment so they can have more time with their loved ones. Everybody gets together, family, friends, coworkers and wishes the retried person a happy next stage in their life. Banners are also very popular at graduation parties, whether it is a high school, college or a technical education center. The idea is to recognize the achievement and accomplishment of that person in the pursuit of education. Las Vegas party banners are not expensive. They average about a couple of dollars a square foot and come with grommets for easy hanging. They can be attached with rope or to walls very easily. 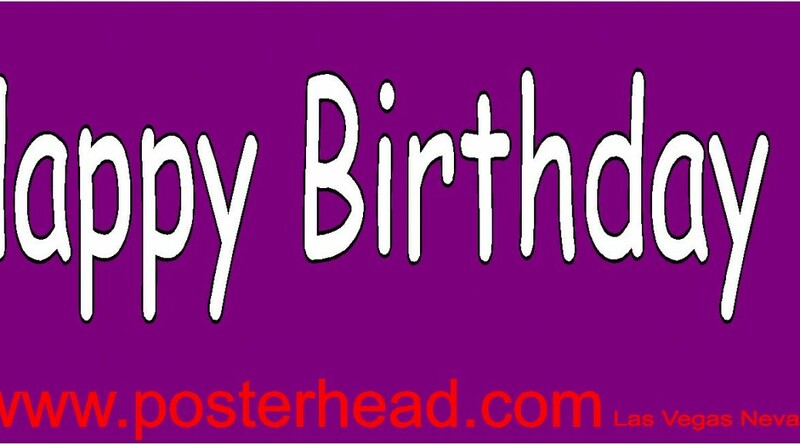 These fun and exciting party banners can be purchased at your local sign shops in the Las Vegas area.